This image shows a whale carcass that washed ashore near Bodega Bay, Calif. on May 17, 2016. BODEGA BAY, Calif. -- A dead gray whale calf was found washed up on a beach north of Bodega Bay on Monday. The Marin County-based Marine Mammal Center was alerted that a whale carcass had washed up on Salmon Creek Beach on Monday morning, center spokesman Giancarlo Rulli said. A team from the center went out to investigate and discovered a male juvenile gray whale dead and thrashing in the surf. It was too far out in the waves for the team to inspect it carefully, and regardless they would have needed special permission to access the beach because it's a protected area for snowy plovers, Rulli said. But by the time they returned today, the whale carcass had drifted back out to sea. Without performing a necropsy, the team could tell little about the whale or how it died, but did identify it as a male juvenile gray whale and noticed it had an injury to the left side of its jaw. Many whales are migrating off the California coast right now, including gray whales, humpback whales and even some blue whales, Rulli said. 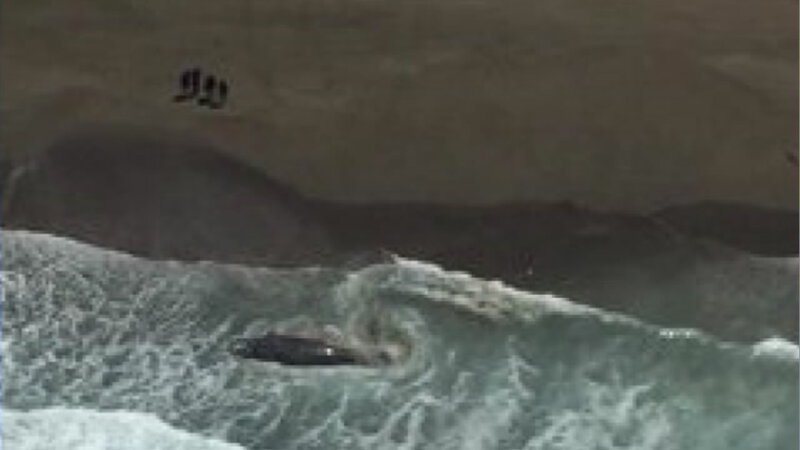 The Marine Mammal Center asks boaters in the area to keep their distance if they see whales. Click here for more stories and videos about whales.